He was a point-and-shoot photographer for 10 years. 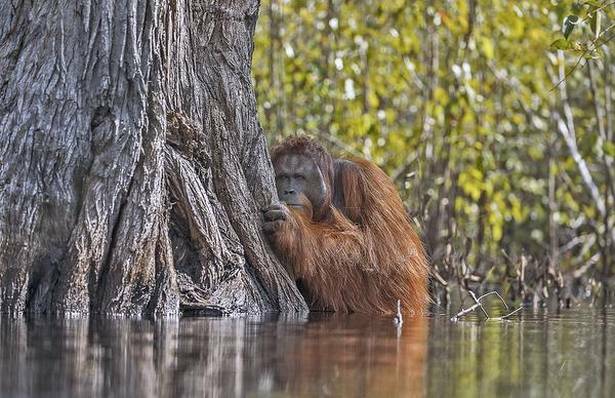 Four years ago, his wife got him a DSLR and today Jayaprakash Joghee Bojan is the National Geographic’s Nature Photographer of the Year 2017 for his photograph of an orangutan crossing a river in the wilds of Borneo. His favourite subjects apart from primates, and organutans in particular, are the tiger and otters. “My first tiger shot was in Bandipur,” he reminisces. “It was a female called Gauri and she had two cubs.” On the subject of otters, he has a lot more to say. While he has photographed otters in the wild in Kabini and Corbett National Park, it is a family of wild otters near his house in Singapore that currently has him captured. “They’ve figured out a way to live in an urban place like Singapore. There’s a community called Otter Watch that tracks the otters across Singapore. They post updates on social media and recently celebrated the birth of new pups. 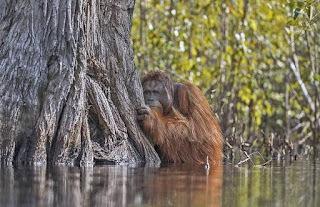 The otters roll on the sand or the grass to clean their fur as the humans watch and even take food from them.” One of Bojan’s photos of a couple of elderly men reaching out to the otters won an award from the Indian website Nature in Focus. Going forward, Bojan hopes to do a photo-story book on primates. “Some of these species number just 50-100 in the wild.” He’s also looking forward to a trip in Japan in February to shoot the snow monkey, the red fox and migrating raptors. He hopes to get some sightings of the elusive snow leopard from a trip to the Spiti Valley later in 2018. Towards the end of the year, if his permissions come through, he’ll be tracking a rare monkey on the Vietnam-China border. “I have lots of photographs to come; many more stories to tell,” he says.